The Information Technology department is committed to ensuring the privacy of your information during and after your tenure here at Regent. But we need your help. By staying up-to-date on the latest techniques for information security, you will protect yourself and others against fraud, theft, and worse. In simplest terms, Password Security is the process of choosing a difficult to guess password, then keeping it a secret. Since your password/s are the primary protection mechanism for your accounts, a poorly chosen (weak) password may result in compromise of personal user information and possibly confidential Regent University information. As such, all Regent University faculty, staff, and students (including visitors, contractors, and vendors with access to Regent University systems) are responsible for taking appropriate measures to select and secure their passwords. Attackers can use programs to compromise easily guessed passwords. When an attacker has access to your accounts, then he/she may inherit access to your private information and/or confidential Regent University information. Because of this, the IT department has adopted more strenuous password complexity requirements. Your new password will make it more difficult for an attacker to compromise your accounts. Remember, your password can be super difficult to guess, but if you share it with anyone, you’ve already compromised your accounts. So choose a difficult to guess password, then keep it a secret. To create such a password, try to utilize phrases instead of words. In this way, you can control what your password is without having some random string of characters that is difficult to remember. Take the following example for instance. We could certainly break this phrase up into many different usable passwords or use the whole phrase if we so choose. For this example, let’s just take the first letter from each word and make a password from it (don’t forget the complexity requirements). In each of these examples, the chosen passwords meet the University guidelines for minimum password criteria. Also, each password is not based on a single dictionary word. Now pick a phrase for yourself. Maybe a Bible verse, famous quote, or anything you like. Remember, don’t use words or phrases that others may think you will use. Don’t make it easy for someone to guess your password! How can I keep my password secret? Passwords are personal information that should never be shared with any other person, including, but not limited to, instructors, assistants, technology service staff, or supervisors. Users should not transmit passwords via email, as this is an insecure medium. Moreover, users are recommended against writing down passwords and/or storing them in an insecure place. Users sometimes record passwords in personal data assistants (PDAs) or other electronic means. While this is not entirely secure, users are encouraged to strengthen security by utilizing encryption capability. Users are discouraged from storing passwords in plain-text (non-encrypted) on any electronic media. Finally, Regent University recommends that passwords not be shared with external accounts such as AOL, Yahoo!, MSN, or other free or paid services. I've got so many passwords, how am I supposed to remember them all? If you have many different accounts with separate passwords (a good idea by the way), then you probably struggle to remember which password goes with what account. Either that or you just make your password very simple so that you don’t forget. There are many programs available (some for free) that help manage passwords. Password Safe is one of these programs. It will allow you to store all of your passwords in one database. It encrypts the database using a key based on one single password you choose. From here on out, all you need to remember is the one password to let you in, then find whatever password you need to get into your other accounts. If you don’t like this one, look around. There are plenty of other password programs out there. The point is that you are being diligent in protecting information, but won’t have to remember so many passwords. Users should contact the Help Desk at 757.352.4076 or helpdesk@regent.edu if a password has been forgotten. The Help Desk has the ability to reset passwords to temporary values. Once a password has been reset, the user should change the password as soon as they are able to gain access to the system. How frequently should I change my password? Regent University recommends that users change their password approximately every 180 days. If at any time a user suspects that his/her password has been compromised, the user should immediately change all passwords to protect individual and university confidentiality. Our password change process will check each new password to make sure that it meets our new requirements. If it doesn’t, you’ll have to try again. To help reduce the chances of getting rejected, make sure that you’ve satisfied the following checklist. If you are ready to change your password, click here to start our three-step process. To help protect Regent University from email-based virus and phishing attacks and to protect you from receiving obnoxious spam messages, IT has implemented Proofpoint Enterprise Protection. This system blocks messages with virus-infected attachments, scam or phishing content and obvious spam messages. The spam filtering is performed based on a confidence level, with the highest confidence spam automatically blocked. Email with an uncertain spam confidence, including ads, newsletters and questionable email can be quarantined by Proofpoint for each user. Due to the advanced scanning engine, legitimate mail has a very low chance of being quarantined. Every week a personal digest is delivered listing details about the email in your quarantine (if your personal quarantine is empty no digest will be delivered). Actions can be taken based on the contents of this quarantine directly from the email digest, or from your quarantine account directly. If no action is taken on emails in the quarantine, they will be deleted after two weeks. Request New End User Digest. This link can be used from any previous digest email to request and updated digest be delivered on demand. Request Safe/Blocked Senders List. These lists can be defined in the quarantine account page. Note: As legitimate mail is unlikely to be quarantined and spam messages are automatically discarded from the quarantine after 4 weeks, the use of Safe/Blocked sender lists is generally not needed for most users. Manage My Account. This link will open the quarantine account page. Spam Score. This indicates the spam confidence of the message in quarantine, rated on a different scale than “definite” spam. Usually a score below 50 is sent directly to your inbox, however there are other spam indicators (header information, number of recipients, spoofing, etc) which may cause a low or zero spam score message to be quarantined. Release. Use this link to release a message to your inbox. If you are unsure about the message you can preview it from within your quarantine account by clicking on the My Account link. Release and Allow Sender. Use this link to release a message to your inbox and add the sender email address to your Safe Senders list. Not Spam. Use this link to report a message that is not spam but has been quarantined. Note: This action does not whitelist a sender but instead requests that this and similar messages be reclassified. If the sign-in page looks different than the examples above, report it to the IT Help Desk and do not enter your credentials. Find. Search quarantined messages by sender, subject or date range. Release. As with the digest, releases messages to your inbox. Not Spam. As with the digest, requests that messages be reclassified. Allow Sender. As with the digest, adds the sender address to your Safe Senders list. Options. Selections for the following: Request a new Digest, Refresh the Quarantine list, Delete All messages from the quarantine. Check boxes – this allows the above actions to be taken on multiple emails at once. Safe Senders. Manually add email addresses here. Mail from these addresses will never be quarantined and will be delivered directly to your inbox. Blocked Senders. Manually add email addresses here. Mail from these addresses will always be quarantined. Note: Obvious spam and malicious mail will be blocked or quarantined automatically, so this list is only necessary for unwanted correspondence that is not being classified as spam. Directly download malware or tracking software. Clicking the link could redirect to a site that automatically starts a virus download. Link to a fake login page that looks like a legitimate site in order to capture credentials. The site could look like a Microsoft login, a bank login or even a Regent login page. Proofpoint URL Defense offers protection against email URL attacks by scanning all emails and attachments for hyperlinks to potentially malicious sites. Links to known-good sites and internal sites are unchanged. For any unknown or potentially risky site, the link target is re-written with a Proofpoint proxy address. This address will be a long URL always starting with https://urldefense.proofpoint.com. All links that are re-written are scanned by Proofpoint for malicious or misleading content. If the site is clean, then the Proofpoint proxy address will re-direct to the original site and the link will work as normal to get to the intended site. Example #4. Phishing message with re-write. No additional action is needed to use this feature. Email security best practices should still be followed but this feature provides an extra line of defense when accidentally clicking on a potentially dangerous link. *Note: if this feature impacts the operation of links to known safe sites, a ticket can be opened through the help desk to exclude them from URL defense. Think of Spam as telemarketing through email. In the same way that you receive those annoying calls at dinner, you can receive those annoying emails at work. Spam runs the full gamut of advertising including home financing, hair loss remedys, or even more embarrassing topics. Try as you may, there is no sure fire solution to getting rid of Spam. Simply put, Phishing is an attempt to defraud the victim. Phishers look to trick users into divulging account information of some sort to gain access and steal what does not belong to them. This is a very creative form of social engineering. Be sure that you really are going to do what you think you’re going to do before you do it. Why do I receive unsolicited email in my Regent inbox? At Regent University, we utilize several layers of filtering to block spam and phishing messages for university Email. Though these methods improve each day, they still lag behind the technologies that the bad guys employ. For this reason, there isn’t a fool-proof solution to blocking spam or phishing messages. Consider this; on an average day, we block more that 20,000 messages. That’s more than half of the incoming messages we receive each day from Internet addresses. Now imagine how much spam or phishing messages would be in your Inbox if we didn’t have the filters in place. What should I do if I receive this kind of email? If you do happen to receive an unsolicited Email message, the best thing to do is just delete it without opening it. For that matter, you shouldn’t open any message you receive that is not of a familiar nature. Instead, you should just delete it from your Inbox. If you get a message in which the originator is trying to trick you (Phishing), you can report it to helpdesk@regent.edu. Our filters receive frequent automated updates from the vendor. For this reason, most unsolicited Email is blocked before it gets to your Inbox. However, some messages slip through. Though this means that you may receive the message, it also means that our system is building a profile of the messages and may block subsequent delivery requests. Think of it as ‘taking one for the team’. You may be one that receives the message, but you are passively helping prevent the message from reaching others. This message says my account information changed, don't I have to respond? For starters, do you even own such an account? Remember, Phishing is Spam (sent to large groups of people) that tries to get you to reveal personal or financial information. If you disclose such information to the perpetrator, it will most likely lead to fraud or identity theft. Many of these target high-volume accounts such as Ebay, Paypal, bank accounts, and online investment accounts. The common theme is that you must login (give username and password) somewhere and do some action. This information may lead a Phisher to compromise your account and execute fraudulent transactions in their favor. In an effort to protect your assets, ask yourself questions about the authenticity of such emails. These criminals are skillful in mimicking genuine sites so you are fooled into handing over your account information. If you do receive an email from an entity to which you actually do belong; consider the context of the message. Did you solicit such a message from the entity or is it unexpected? If you ever have any doubts about the authenticity of such messages, don’t hesitate to contact them directly to verify the action they are asking you to take. Remember, your personal information, accounts, and future are at risk in these Phishing scams. Protect yourself from unnecessary disclosure. There has been a rise in messages that include e-card greetings from unknown users. While Regent’s email security servers are preventing more than 95% of spam and virus activity from reaching Inboxes, there are some messages that pass through. Please be advised that e-card greeting messages are heavily being used to transmit viruses and aim to infect your computer. Please use the following general guidelines when opening email messages. 1. Make sure you are running Antivirus software and that the virus definitions are the most current release. 2. Never open messages with subject lines that do not make sense. Examples include reply indicators without you having sent an email in the first place. 3. Be very wary of messages from people you do not know. While we all have to interact with new people, we generally know the business that transpires between parties. If a message comes through from an unknown person with an illogical subject line, give due consideration prior to opening the message. 4. Delete suspect messages without opening them. Sometimes viruses only need you to open a message in order to infect your computer. To avoid this, don’t open messages you think might cause infection. If you have and questions or concerns about this or any virus or security threat please contact the Help Desk at 757.352.4076 or helpdesk@regent.edu. Recently there have been emails sent to our users from a bogus address and are not in any manner affiliated with the Regent University Help Desk or IT department. The following describes the message. However, there could easily be multiple variants of this message. Please revert back to original passwords due to some technical difficulties until further notice. Thank you. If you should receive any message from the IT department or University Help Desk and are unsure of its authenticity, please contact the Help Desk at 757.352.4076 or helpdesk@regent.edu. The FBI today warned the public to avoid falling victim to an on-going mass email scheme wherein computer users received unsolicited emails purportedly sent by the FBI. These scam emails tell the recipients that their Internet use has been monitored by the FBI and that they have accessed illegal web sites. The emails then direct recipients to open an attachment and answer questions. The email appears to be sent from the email addresses of mail@fbi.gov and admin@fbi.gov. There may be other similarly styled addresses. The recipient is enticed to open the zip attachment which contains a W32/SOBER.JEN@MM worm. The attachment does not open and its goal is to utilize the recipient’s computer to garner information. Secondly, the virus allows the email to be forwarded to all those listed in the recipient’s address book. A spam/phishing email message remains in circulation claiming that recipients are eligible for a tax refund from the IRS. The email appears legitimate, but the link included within does not send the user to the IRS website. This reflects typical phishing characteristics and users should remain aware of these types of messages. The IRS website provides excellent guidance on how to determine fraudulent email. Please read the full details on the Internal Revenue Service’s real website. What do you mean by Workplace Security? When we mention this term, we just don’t mean the physical security that our Public Safety Office provides. In this sense, we mean doing your duties with the mindset of protecting private and confidential information. This doesn’t necessarily mean that you are purposely doing things to disclose private data. You could be doing things that aren’t considered responsible use. Think about it. Do you do enough to ensure that the information you handle from day to day does not fall into the wrong hands or get into the view of wandering eyes? Workplace Security is a concept that we should all subscribe to. Be sure that you do your job protecting all of the information as if it were your own private data. Well, it’s basically you using the computing systems in the manner for which we provide them to you. When you become a student, faculty, or staff at Regent University, you are permitted to use our computing systems to complete your work and for limited personal use. You are required to become familiar with the Acceptable Use Policy as it provides guidance for what kind of use is and is not permitted on the university’s information systems. If you are a faculty or staff, you’ve already acknowledged that you’ve read and understand the policy. If you’re a student, this policy is included in your student handbook. Either way, you should become familiar with all of the policies that govern information systems use within the university. This will help you understand how to properly utilize our computers and help you to inform others if they are misusing an information system. What do you suggest I do to be more secure? If you didn’t create or think of something first, you should be sure to seek licensure or properly credit the bearer of the Intellectual Property rights. We are all somewhat familiar with plagiarism, copyright infringement, trademark violations, patent infringement, and yes, even digital copyright infringement. Though this list is not comprehensive, you get the point. If you have questions about the origin or ownership of something you plan to use, make sure that it’s not already another’s protected work. Even ideas are protected so take care that you don’t use something without properly licensing use, crediting the true source, or violating another’s legal protections. 1. Dishonesty. This is lack of integrity exhibited through lying, cheating, defrauding or deceiving. Examples of dishonesty include: copying from the examination paper of another, allowing one’s own examination paper to be copied, reading without the instructor’s consent a copy of the examination prior to the date it is given, giving or receiving unpermitted aid on a take-home examination, class assignment, project and other papers; use of unauthorized aids; submitting the same work product in more than one course without the express permission of the instructor(s); or disclosing or accepting information if one takes a test at a different time than other students in the same course. How does Regent make sure that I'm not borrowing another's work improperly? At Regent, we have licensed a software application called SafeAssign. This application let’s our staff and faculty evaluate our students’ submissions. Is my file sharing application downloading licensed files? There are many different file sharing applications available for use over the Internet. When you choose to use one of these, be sure that it shares your music, video and other files legally. In most cases, you should be required to pay a fee to ‘swap’ files. An obvious sign that you are violating copyright is if you are not paying to download new files or share files you have already acquired. Examples may include KaZaA, Gnotella, Limewire, and Morpheus. You should also understand that having these kind of applications on your personal pc may allow other users to connect directly to your pc. This is an extreme security risk. Further, if you install these kind of applications on your University owned workstation or laptop you are violating Regent policy. By allowing others to connect to a Regent workstation or laptop, you expose the University network to unnecessary security risks. As such, violation of this or other University policies may lead. Where can I learn more about copyright protections and applicable legislation? Not sure what you may and may not do with your university owned computing systems? Read through this policy to see how you can stay in bounds while using your computer. This policy also provides example of misuse so you can stay on the right path. Because Regent University provides all employees and students with an Electronic Mail (Email) address, we expect our users to abide by this policy. Within it, you will learn what is permissible and what sort of activity you should avoid. It’s true you do have significant leeway when it comes to using your Regent Email account. However, this policy will give you a better perspective regarding appropriate use. Reading and understanding this policy sets you on the right path for sending and receiving Email with your Regent account. So you bring your own laptop to the university? You’ve got temps, contractors, or visitors coming? Be sure you are familiar with the rules that govern who and what may attach to the university’s private networks. We provide a robust wired and wireless public access network for all to use. Make sure that you’re following the guidelines and procedures we recommend so you don’t expose our private network to unnecessary security risks. The Internet has become a revolutionary tool with regard to social networking and there is no shortage of online brokers that offer a place for all to share information about themselves and become more acquainted with others. Unfortunately, there are predatory individuals on the Internet as well and these persons present a real danger to others. 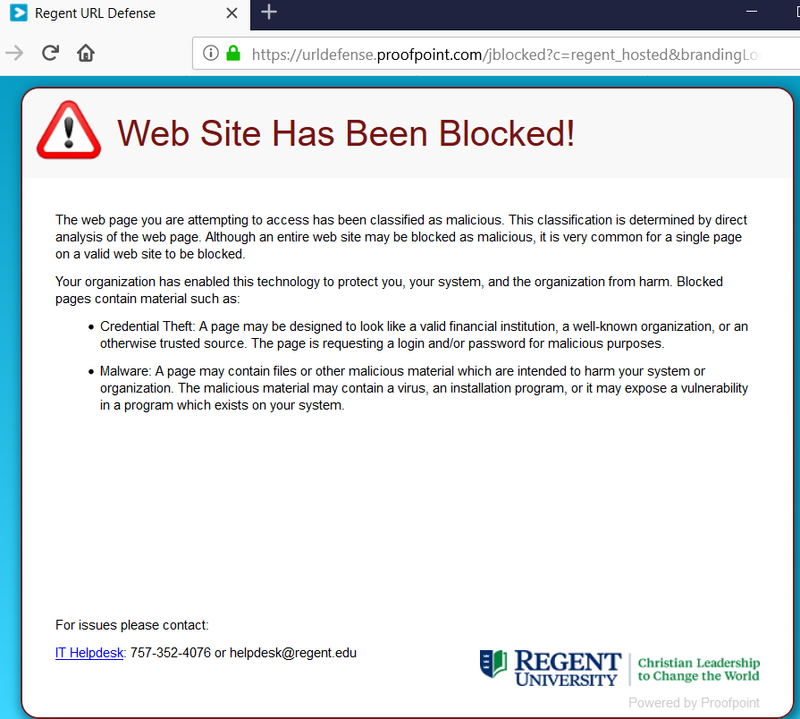 For this reason, Regent University offers this notice in an effort to educate its users of the dangers of such information sharing. More information about password requirements and secrecy guidelines. We can’t stress the importance of your password. It’s the only thing that separates an intruder from your personal account information. If you’re a faculty or staff at Regent, there’s even more on the line. If an intruder were to compromise your account, it could lead to FERPA violations, HIPAA violations, or other legislative infractions. Learn how to prevent these pitfalls by reading this policy. Peer to Peer programs are bandwidth hogs and most people don’t even know they have these programs installed. Most peer to peer programs share out copyrighted music and movies which is against the law. This policy breaks down our rules and regulations to protect you and the University. Regent University provides Antivirus software to all managed workstations and laptops. If you believe your Regent computer does not have Antivirus software on it or the definitions are out-of-date, call the Help Desk immediately. The Federal Trade Commission provides useful Consumer Information on how to protect yourself online. Symantec Security Response provides detailed information about current threats and how to protect your computer. "You do have to make sacrifices. But, this is not a negative thing. You can get through it and most importantly, you don't have to compromise your principles. It all works out." "Regent's program resonated with me because it's about servant leadership and mentoring and coaching. That is so important. At the end of the day, it's about the legacy you leave behind."